Early last Sunday, after giving my daughter a bottle, putting on the kettle for coffee, and glancing over the front page of the New York Times, I moved on to the next stop in my morning routine: I went to Reddit. Like many of us, I’ve started to think of Reddit as a convenient curator of whatever happens to be taking place online that day, and after customizing the landing page to my tastes—unsubscribing from the meme factories, keeping the discussions of news and politics well out of view—it has gradually turned into the site where I spend most of my time. (It’s also started to leave a mark on my home life: I have a bad habit of starting conversations with my wife with “There was a funny thread on Reddit today…) That morning, I was looking over the top posts when I noticed a link to an article about the author George R.R. Martin and his use of the antiquated word processor WordStar to write all of his fiction, including A Song of Ice and Fire, aka Game of Thrones. At first, I was amused, because I’d once thought about submitting that very tidbit myself. A second later, I realized why the post looked so familiar. It was linked to this blog. At that point, my first thought, and I’m not kidding, was, “Hey, I wonder if I’ll get a spike in traffic.” And I did. In fact, if you’re curious about what it means to end up on the front page of Reddit, as of this writing, that post—which represented about an hour’s work from almost a year ago—has racked up close to 300,000 hits, more than doubling the lifetime page views for this entire blog. 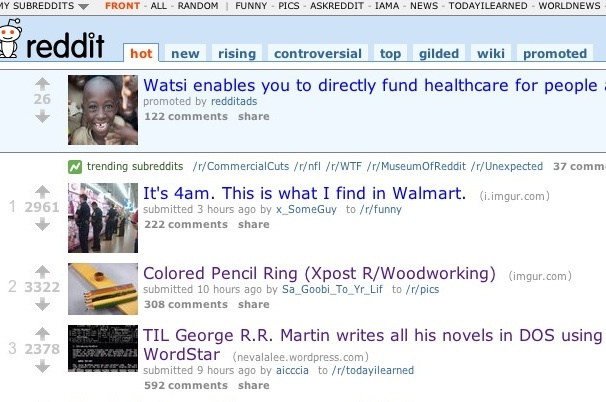 At its peak, it was the third most highly ranked post on Reddit that morning, a position it held very briefly: within a few hours, it had dropped off the front page entirely, although not before inspiring well over 1,500 comments. Most of the discussion revolved around WordStar, the merits of different word processing platforms, and about eighty variations on the joke of “Oh, so that’s why it’s taking Martin so long to finish.” The source of the piece was mentioned maybe once or twice, and several commenters seemed to think that this was Martin’s blog. And the net impact on this site itself, after the initial flurry of interest, was minimal. A few days later, traffic has fallen to its usual modest numbers, and only a handful of new arrivals seem to have stuck around. (If you’re one of them, I thank you.) And it’s likely that none of this site’s regular readers noticed that anything out of the ordinary was happening at all. 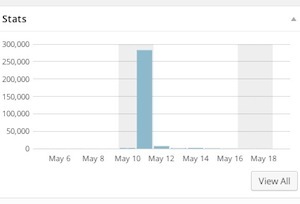 In short, because of one random link, this blog received an influx of visitors equivalent to the population of Cincinnati, and not a trace remains—I might as well have dreamed it. But then again, this isn’t surprising, given how most people, including me, tend to browse content these days. When I see an interesting link on Reddit, I’ll click on it, skim the text, then head back to the post for the comments. (For a lot of articles, particularly on science, I’ll read the comments first to make sure the headline wasn’t misleading.) I’ll rarely, if ever, pause to see what else the destination site has to offer; it’s just too easy to go back to Reddit or Digg or Twitter to find the next interesting article from somewhere else. In other words, I’m just one of the many guilty parties in what has been dubbed the death of the homepage. The New York Times landing page has lost eighty million visitors over the last two years, and it isn’t hard to see why. We’re still reading the Times, but we’re following links from elsewhere, which not only changes the way we read news, but the news we’re likely to read: less hard reporting, more quizzes, infographics, entertainment and self-help items, as well as the occasional diverting item from a site like this. And it’s a reality that writers and publishers, including homegrown operations like mine, need to confront. The migration of content away from homepages and into social media isn’t necessarily a bad thing; comments on Reddit, for instance, are almost invariably more capably ranked and moderated, more active, and more interesting than the wasteland of comments on even major news sites. (Personally, I’d be fine if most newspapers dropped commenting altogether, as Scientific American and the Chicago Sun-Times recently did, and left the discussion to take place wherever the story gets picked up.) But it also means that we need to start thinking of readers less as a proprietary asset retained over time than as something we have to win all over again with every post, while getting used to the fact that none of it will last. Or almost none of it. A few days after my post appeared on Reddit, George R.R. Martin was interviewed by Conan O’Brien, who asked him about his use of WordStar—leading to another burst of coverage, even though Martin’s preferences in word processing have long been a matter of record. And while I can’t say for sure, between you and me, I’m almost positive that it wouldn’t have come up if someone on Conan’s staff hadn’t seen my post. It isn’t much. But it’s nice.